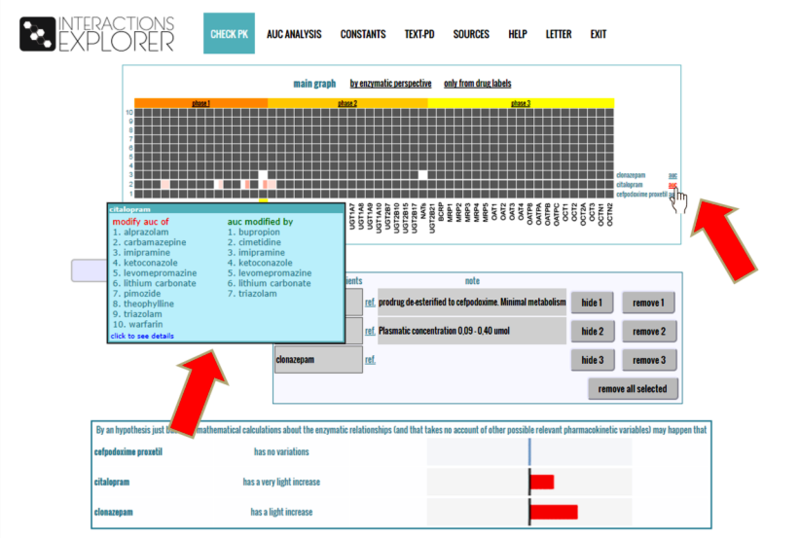 As well as from the main menu you can also access the AUC analysis page moving the pointer on the word “AUC” in the list at the right side of the graph: in the box you’ll find a list of the drugs with whom the selected a.i. was studied. To begin with, select an active principle in the menu. Another menu will appear in the right with the list of active principles modified by the first. Having selected one of the a.i. in the list, the graph will show the level of variation, which may be more or less significant. Values between 0.8 and 1.25 are considered insignificant falling into the area of bioequivalence. Below the graph there are specified bibliographic references, the doses used, the samples sizes and the routes and frequencies of the administrations. Also is reported if the change in AUC refers to an a.i. or its metabolite. The considered AUC is usually the “AUC inf” – inf = infinite – (the entire area under the curve in the maximum time of the presence of the active substance in the blood). If the AUC inf is not available, we refer to the longer area under the concentration curve reported in the study. The dosage is referred as the total daily dose. A comparison between different distributions of the doses along the day will always be specified when needed. Sometimes the doses can be variable. In this case the dash (e.g. 30-60 mg) will indicate that the dosage ranges between the two doses, while the slash (e.g. 400/200) means that the dosage has changed during the study, by decreasing or increasing, compared to the initial dose. Sometimes the graph visualization may be confusing, therefore, the data is not reported except in the section of text (Text-PD). For example, some studies of potent cytochromial inhibitors are made with lower doses of substrates and then compared to full dose. For instance, in a study the AUC of sildenafil 25 mg with darunavir / ritonavir 800/200 is compared to 100 mg sildenafil alone: AUC = 0.97 indicating in this case a substantial increase in sildenafil blood levels in the presence of inhibitors.